Water temperature: Maximum 70 °C,Minimum 4 °C. Check your faucet at first, if there is an aerator on the faucet spout, unscrew it..
1. Faucets with outside thread: The outside thread diameter is about 21.5mm. 2. Faucets with inner thread: The innner thread diameter is about 23.5mm. 3. Faucets without thread : The outside diameter is between 15~21mm. 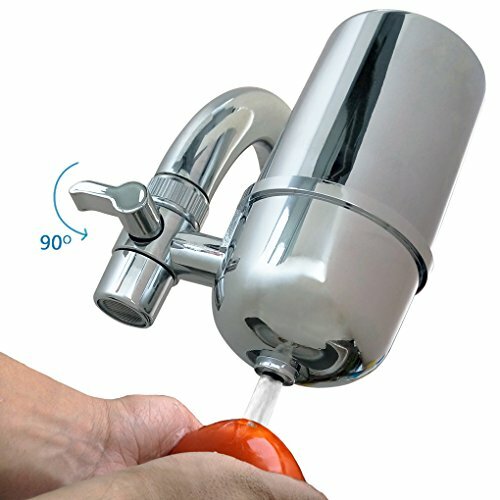 and the faucet spout length must be longer than 2cm,or it will be easy to slide down. 4. Will not work with pull-out or hand-held faucets..
How to clean water？- Filter filled with Activated Carbon,KDF55 that can reduce contaminants（like sediment, chlorine, cysts, benzene, asbestos, mercury & lead）, KDF55 also can kills bacteria and inhibits the growth of scale, lime, mold, and fungi. Improves taste - Get rid of that horrible chlorine smell and sour taste. Experience just plain water, what you should expect from your tap. Sturdy Convenient design- Made from durable, no-leak Food grade ABS plastic. Clean water at the flip of a switch. No bulky water pitchers that take up counter space. If you have any questions about this product by Kabter, contact us by completing and submitting the form below. If you are looking for a specif part number, please include it with your message.